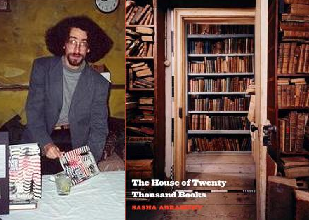 The House of Twenty Thousand Books is journalist Sasha Abramsky’s elegy to the vanished intellectual world of his grandparents, Chimen and Miriam, and their vast library of socialist literature and Jewish history. A rare book dealer and self-educated polymath who would go on to teach at Oxford and consult for Sotheby’s, Chimen Abramsky drew great writers and thinkers like Isaiah Berlin and Eric Hobsbawm to his north London home; his library grew from his abiding passion for books and his search for an enduring ideology. The books, documents, and manuscripts that covered every shelf at 5 Hillway were testaments to Chimen’s quest — from the Jewish orthodoxy of his boyhood, to the Communism of his youth, to the liberalism of his mature years. The House of Twenty Thousand Books is at once the story of a fascinating family and chronicle of the embattled twentieth century. Sasha Abramsky is the author of Conned: How Millions Went to Prison, Lost the Vote, and Helped Send George W. Bush to the White House, and has reported on U.S. prisons for Human Rights Watch. He lives in Sacramento, California. Jeremy Solomons is a PhD candidate in English Literature at the University of Reading, U.K., and Scholar in Residence at the Elie Wiesel Center for Jewish Studies at Boston University, U.S.A. His topic is Post World War 2 Anglo-Jewish drama. He has studied theatre with Augusto Boal (Theatre of the Oppressed) and Keith Johnstone (Impro). After 15 years working full-time in professional theatre on the production side, he founded youth theatres in England writing and directing over 20 productions. Since then he has been a bookstore manager, taught writing, literature, and drama at colleges, in the U.K. and New England, where he lives in Brookline, MA with his wife and they have two college age sons. These days, alongside doing research, he teaches, writes and helps people with web, written, and spoken communication using his drama and improvisation experience and does project management for various organizations and businesses. This entry was posted in History, Non-Fiction and tagged Chimen Abramsky, Sasha Abramsky. Bookmark the permalink.